Is Your PowerPoint Training Missing Out On this? There are a ton of books and articles on PowerPoint. So why on earth do we need to start up this site? Well, there are 3 important things you need to look for in your PowerPoint Training. Most training – books- workshops miss the 3 things. Want to know more about what these 3 aspects are and why you need to bookmark THIS site? Please watch the video..
Post graduate degree in management from Indian Institute of Management, Kozhikode- a premier B-School. Guest Post on Rethink Presentations site on reducing clutter in slides. Contest Winner on Slideshare content Presentation Horror Story in 2010. Our winning entry: Confessions of a Horrified Audience. Interview by PowerPoint MVP Geetesh Bajaj on Indezine site about our contest. I worked in 2 multinational corporations for over 15 years before taking the plunge as an entrepreneur. There is a void in the presentation skill levels of business executives. Many of them had brilliant ideas, but they lacked the skills necessary to sell those ideas effectively to internal and external customers. Our content is among the top 1% of most viewed on SlideShare in 2013. Slideshare is a top presentation sharing website online. This achievement reflects the quality of our content. You can see our page statistics and top presentations here. 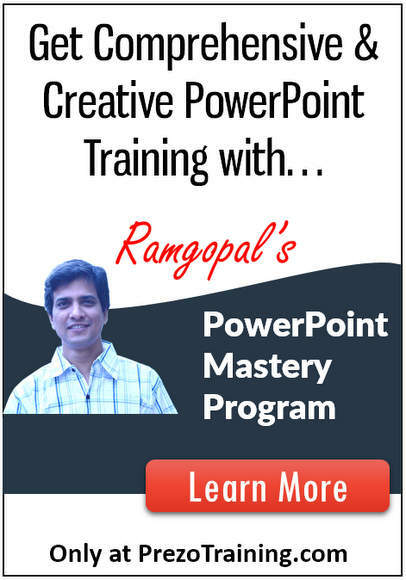 I am Ramgopal’s wife and business partner. I worked at Oracle Financial Solutions (earlier I-flex solutions) earlier and the experience gave me multiple opportunities to travel and interact with clients across the world.